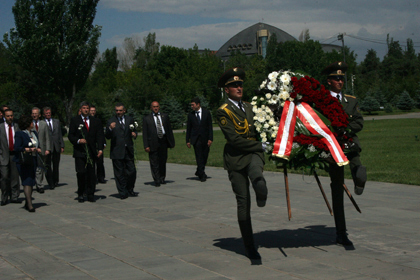 29.11.10 The head of the Russian Presidential Administration Sergey Narishkin visited Tsitsernakaberd Memorial Complex of the Armenian genocide in the framework of a state visit in Armenia and laid a wreath at the monument of the Armenian Genocide victims. Mr. Narishkin, accompanied by the director of the Armenian Genocide Museum-Institute Hayk Demoyan, got acquainted with materials depicting the big tragedy of 1915, and left a note in the Commemoration Book. 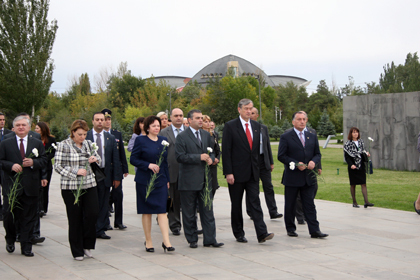 16.10.10 The Minister of Education and Science of Georgia D. Shashkin visited Tsitsernakaberd Memorial Complex of the Armenian genocide in the framework of a state visit in Armenia and laid a wreath at the memorial of the Armenian Genocide victims. The delegation also put flowers at the eternal fire and honored their memory with a minute of silence. Afterwards, D. Shashkin visited Armenian Genocide Museum and left a note in the commemoration book. 12.10.10 The representatives of the Armenian Relief SocietyвЂ™s offices of 26 countries of the world within the framework of the 100th Anniversary of the Armenian Relief Society (HOM, ARS) visited Tsitsernakaberd Memorial Complex of the Armenian genocide and laid a wreath at the memorial of the Armenian Genocide victims. The crowded delegation put flowers at the eternal fire and honored their memory with a minute of silence giving a requiem of liturgy. Afterwards the heads of the Armenian Relief SocietyвЂ™s offices planted a fir at the Memorial Alley and a mass tree planting was organized in the Tsitsernakaberd park area. 11.10.10 Slovenian President Danilo TГјrk and his spouse Barbara Miklic TГјrk visited Tsitsernakaberd Memorial Complex of the Armenian genocide in the frame of a state visit and laid a wreath at the memorial of the Armenian Genocide victims. They also put flowers at the eternal fire and honored their memory with a minute of silence. 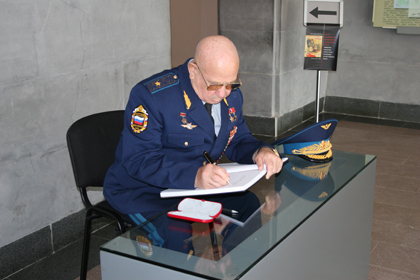 Afterwards, Danilo TГјrk visited Armenian Genocide Museum and left following note in the commemoration book. вЂњI am deeply waved by the memory of one of the most heinous crimes of the 20th century and the entire history of humankind. Let the history from now on be different. History must never repeat itself in this worst imageвЂќ. The Slovenian President planted a fir at the memory park of Tsitsernakaberd Complex. 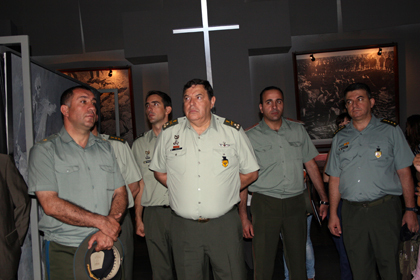 24.08.10 Chief of Greek General Staff of Land Forces, Lt. General Frangos Frangoulis is in Armenia on two-day working visit and today the delegation visited Tsitsernakaberd Memorial Complex of the Armenian genocide and laid a wreath at the monument of the Armenian Genocide victims and honored their memory with a minute of silence. Afterwards the delegation took a tour in the Armenian Genocide Museum and Lt. General Frangos Frangoulis left a note in the Commemoration Book. 19.08.10 On August 19, by the invitation of President Serzh Sargsyan, President of the Russian Federation Mr. Dmitry Medvedev arrived to Yerevan on a state visit. 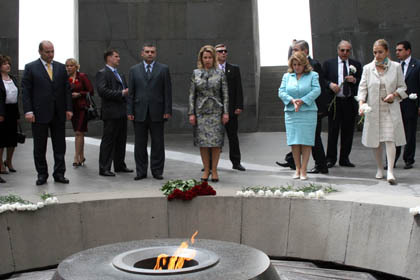 The leader of RF visited Tsitsernakaberd Memorial Complex of the Armenian genocide, laid a wreath at the memorial of the Armenian Genocide victims and also put flowers at the eternal fire and honored their memory with a minute of silence. Afterwards Mr. Medvedev watered the fir, which has been planted by him at the Memory Alley two years ago. The national anthem of the Russian Federation was heard at the Tsitsernakaberd hill. The Director of the Armenian Genocide & Museum Institute Hayk Demoyan presented to the Russian President the history of construction of the Tsitsernakaberd Memorial Complex, its importance for Armenians, who usually visit, and the meaning of April 24. 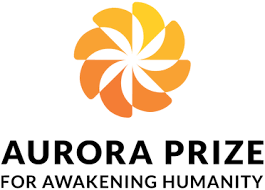 The Resolution by the State Duma of the Russian Federation (On April 14, 1995) condemns the perpetrators of the extermination of Armenians from 1915 to 1922; and recognizes April 24 as a Remembrance Day for the victims of the Genocide. 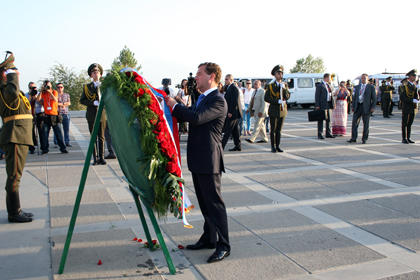 14.07.10 The Polish delegation by the head of Polish Foreign Minister Radoslaw Sikorski, visited Tsitsernakaberd Memorial complex and laid a wreath at the monument of the Armenian genocide victims. Afterwards the delegation took a tour in the Armenian Genocide Museum and Foreign Minister left a note in the Commemoration Book. Mr. Radoslaw Sikorski planted a fir at the Memorial Alley. 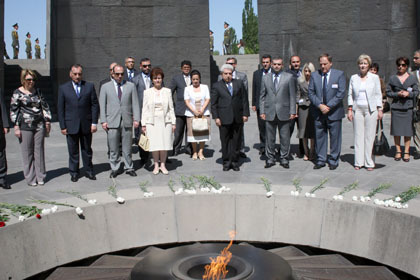 13.07.10 The delegation headed by Judge Micha Lindenstrauss, State Comptroller and Ombudsman of Israel had a private visit to the Tsitsernakaberd Memorial complex and laid a wreath at the monument of the Armenian genocide victims. 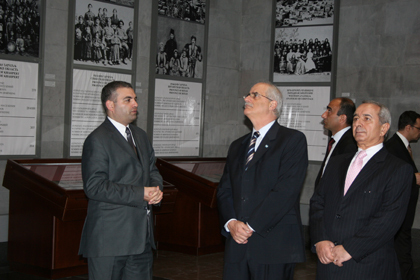 Afterwards the delegation took a tour in the Armenian Genocide Museum. 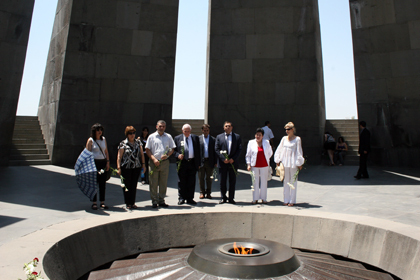 08.07.10 The delegation headed by the Chairman of the Armenian-French Parliamentary Friendship group Serzh Lagosh visited Tsitsernakaberd memorial complex and laid a wreath at the monument of the Armenian genocide victims. Afterwards the delegation took a tour in the Armenian Genocide Museum. 26.06.10 The delegation headed by Federal Minister for European and International Affairs of Austria Michael Spindelegger visited Tsitsernakaberd Memorial complex and laid a wreath at the monument of the Armenian genocide victims. Afterwards the delegation took a tour in the Armenian Genocide Museum, where Michael Spindelegger left a note in the Commemoration Book. Michael Spindelegger planted a fir at the Memorial Alley. 11.06.10 The French parliamentariansвЂ™ delegation of the French National Assembly visited Tsitsernakaberd Memorial complex and put flowers at the monument of the Armenian genocide victims. 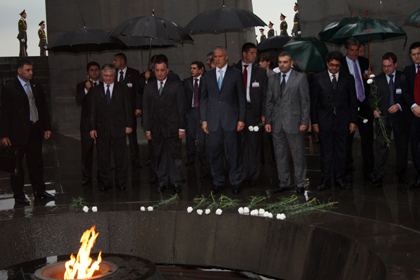 21.05.10 The delegation headed by Minister of Foreign Affairs of Argentina Khorkhe Tayana visited Tsitsernakaberd Memorial complex and laid a wreath at the monument of the Armenian genocide victims. Afterwards the delegation took a tour in the Armenian Genocide Museum, where Khorkhe Tayana left following note in the Commemoration Book. вЂњI deeply bend down before the memory of the Armenian genocide victimsвЂќ. In memory of the Armenian Genocide victims Khorkhe Tayana planted a fir at the Memorial Alley. 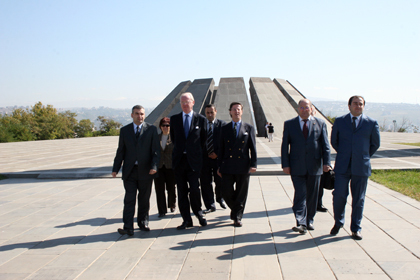 19.05.10 The delegation headed by pilot and spaceman Alexey Leonov visited Tsitsernakaberd Memorial complex and laid a wreath at the monument of the Armenian genocide victims. Among other members the delegation also comprised Victor Gorbatko and Vladimir Lyakhov. Afterwards the delegation took a tour in the Armenian Genocide Museum and Alexsey Leonov left following note in the Commemoration Book. вЂњNo beast can devise crime more horrible, than the genocide against the ancient people perpetrated by the Ottoman Empire. It was the beginning of crimes committed in different parts of the globe. As long as humanity exists it should be condemned in all countries of the world regardless of the leaders and legal assessment should be given to it as a terrible crime against humanityвЂќ. The delegation planted a fir at the Memorial Alley. 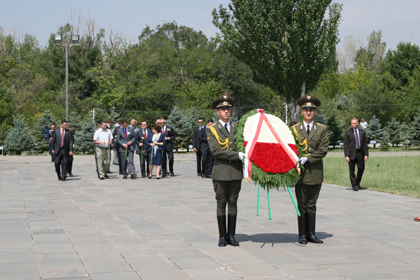 18.05.10 The delegation headed by Czech PM Jan Fischer visited Tsitsernakaberd Memorial complex and laid a wreath at the monument of the Armenian genocide victims. Afterwards the delegation took a tour in the Armenian Genocide Museum, where Jan Fischer left following note in the Commemoration Book. вЂњI was deeply impressed by all what I have seen in the museum, and by what happened of the beginning of the 20th century. We should never forget itвЂќ. In memory of the Armenian Genocide victims Jan Fischer planted a fir at the Memorial Alley. 01.05.10 On May 1, the International Association of dentists from over a hundred countries arrived in Armenia. 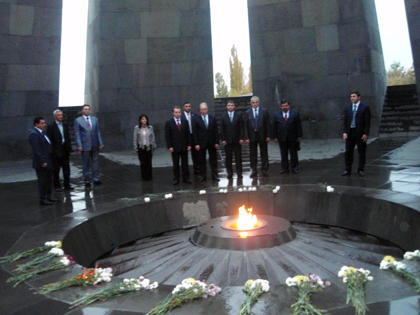 The delegation visited Tsitsernakaberd memorial complex and put flowers at the monument of the Armenian genocide victims. Afterwards the delegation took a tour in the Armenian Genocide Museum and left a note in the Commemoration book. 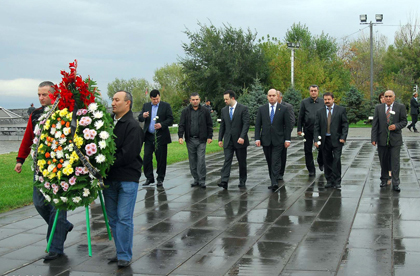 08.04.10 The delegation headed by the Secretary General of the International organization of Francophonia Abdou Diouf visited Tsitsernakaberd Memorial complex and laid a wreath at the monument of the Armenian genocide victims. 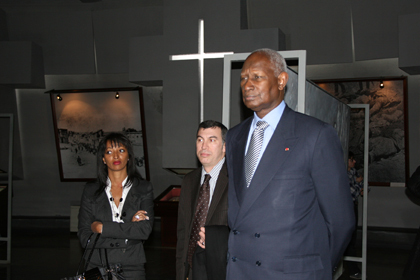 Afterwards the delegation took a tour in the Armenian Genocide Museum and Abdou Diouf left a note in the Commemoration Book, where he noted вЂњWe should live with recognizing the past. We must stand up against the crimes against the humanity in the presentвЂќ. Abdou Diouf planted a fir at the Memorial Alley. 17.03.10 Today the delegation headed by Patriarch of Moscow and all Russia His Holiness Kyrill I accompanied by Supreme Patriarch and Catholicos of all Armenians Garegin II visited Tsitsernakaberd Memorial complex and laid a wreath at the monument of the Armenian genocide victims and gave a requiem liturgy. Afterwards the spiritual delegation took a tour in the Armenian Genocide Museum and Kyrill I left a note in the Commemoration Book, where he noted вЂњEternal memory of massacred innocent Armenian brothers and sisters. Let God preserve the Armenian land and people, and forbid any people the sufferings presented in this mournful memory place. His Holiness Kyrill I planted a fir at the Memorial AlleyвЂќ. 12.03.10 Today the delegation of the Republic of Poland headed by Prime Minister Donald Tusk visited Tsitsernakaberd Memorial complex and laid a wreath at the monument of the Armenian genocide victims. Afterwards the Polish delegation took a tour in the Armenian Genocide Museum and Donald Tusk left a note in the Commemoration Book, where he noted вЂњI bend down before all the victims of the Genocide. Poland lost millions of its citizens in the past century and thoroughly understands the ArmenianвЂ™s griefвЂќ. Donald Tusk planted a fir at the Memorial Alley. 05.03.10 Today the prominent filmmaker Emir Kusturitsa visited Tsitsernakaberd Memorial Complex. Filmmaker Emir Kusturitsa paid a tribute of respect to the victims of the Armenian genocide and put flowers at the memorial of the Armenian genocide. Afterwards Emir Kusturitsa planted a fir at the Memorial Alley. Emir Kusturitsa had a tour of the Armenian Genocide Museum, where he left a note in the Commemoration Book. Kusturitsa noted that вЂњWe became the victims of the same crimeвЂќ. Emir Kusturitsa also interested in the first film about Armenian Genocide entitled вЂњRavished ArmeniaвЂќ, which demonstrates in the Museum. 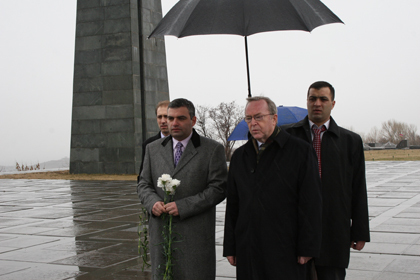 04.03.10 The delegation headed by the leader of the European People's party Wilfried Martens visited Tsisernakaberd memorial complex and laid a wreath at the monument of the Armenian genocide victims. Afterwards the delegation took a tour in the Armenian Genocide Museum and Wilfried Martens left a note in the Commemoration Book. 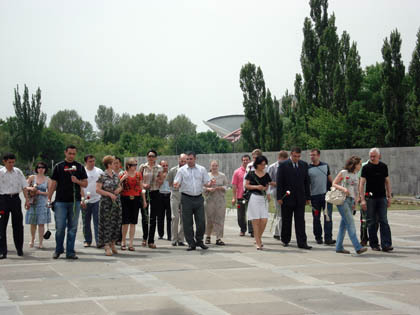 04.03.10 The Czech parliament delegation headed by vice-chairman of the Chamber of Deputies Vojtech Filip visited Tsisernakaberd memorial complex and laid a wreath at the monument of the Armenian genocide victims. Afterwards the Czech delegation took a tour in the Armenian Genocide Museum and Vojtech Filip left a note in the Commemoration Book. 10.12.09 President of the Republic of Latvia Valdis Zatlers and his spouse Mrs. Lilita Zatlers who are in Armenia by the invitation of the President of the Republic of Armenia Serzh Sargsyan, visited Tsitsernakaberd Memorial Complex of the Armenian genocide. The Latvian delegation paid a tribute to the victims of the Armenian genocide and put flowers at the genocide memorial. The delegation took a tour of the Armenian Genocide Museum, where Mr. Zatlers left a note in the Commemoration book: вЂњHuman memory cannot be obliterated, as it remains forever and passes from generation to generationвЂќ. Afterwards the President of Latvia planted a fir at the Memorial alley. 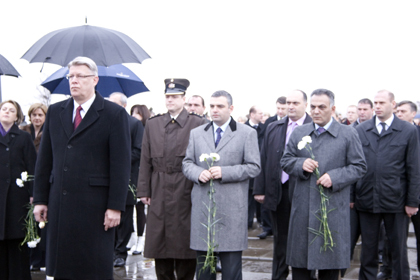 28.11.09 The delegation headed by the National Defense Minister of Poland, Bogdan Klich visited Tsitsernakaberd and paid a tribute to the memory of the victims of the Armenian Genocide. Poland delegation put flowers at the memorial of the Armenian Genocide victims and Mr. Bogdan Klich planted a fir at the Memory Alley. Then the National Defense Minister of Poland and the delegation took a tour of the Armenian Genocide Museum, where Mr. Klich left a note in the Commemoration Book. 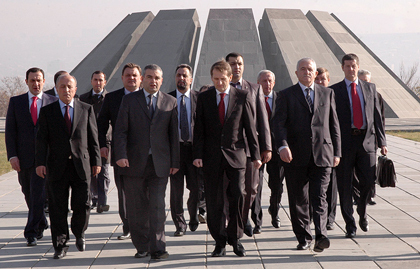 30.10.09 Today the Foreign Minister of Belarus Sergey Martinov, visited Tsitsernakaberd Memorial Complex. The Belarusian delegation paid a tribute of respect to the victims of the Armenian genocide and put flowers at the memorial of the Armenian genocide. Then the Foreign Minister of Belarus planted a fir at the Memory Alley. The delegation took a tour of the Armenian Genocide Museum, where Mr. Martinov left a note in the Commemoration Book. 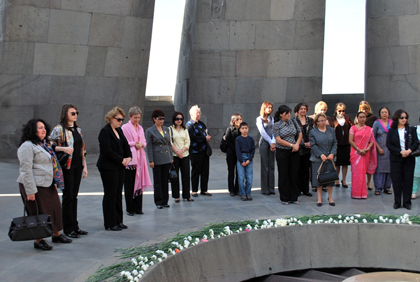 17.10.09 On October 16, the Association of the spouses of the foreign diplomats accredited in Armenia headed by Natalia Nalbandyan visited Tsitsernakaberd memorial of the victims of the Armenian genocide. The spouses of the diplomats and woman diplomats paid a tribute at the memory of the innocent victims of the Armenian genocide and put flowers at the memorial of the victims. 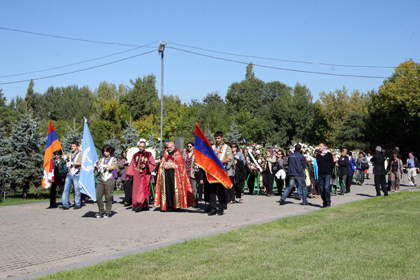 Afterwards the members of the вЂњAssociation Welcome ArmeniaвЂќ planted a fir at the Memory Alley. The women of the diplomats and the woman diplomats had a guided tour in the Armenian Genocide Museum, got acquainted with the history of the Armenian genocide in details, and left a note in the Commemoration Book. 02.10.09 Deep Purple founder and vocalist Ian Gillan, Black Sabbath guitar player Tony Ayommy, Asia rock groupвЂ™s keyboard player Jeff Downs, as well as tennis-player, winner of 1987 Wimbledon male tournament Pet Kesh and вЂњRock Helps ArmeniaвЂќ project author and Australian Do something organizationвЂ™s director John Din arrived in Yerevan on October 1, Thursday. Today, world-wide rock stars visited also Tsitsernakaberd Memorial Complex, paid a tribute of respect to the victims of the Armenian genocide and put flowers at the memorial of the Armenian genocide. The delegation took a tour of the Armenian Genocide Museum, where famous musicians left a note in the Commemoration Book. 02.10.09 The Speaker of Belgian Senate Armand De Decker and the delegation headed by him visited also Tsitsernakaberd Memorial Complex; laid a wreath at the monument to the victims of the Armenian Genocide. The Belgian delegation paid a tribute of respect to the victims of the Armenian genocide and put flowers at the memorial of the Armenian genocide. Then the Speaker of Belgian Senate planted and his delegation took a tour of the Armenian Genocide Museum, where Mr. De Decker left a note in the Commemoration Book. 28.07.09 By the invitation of the president of Armenia Serzh Sargsyan, the president of the Republic of Serbia, Boris Tadic arrived to Armenia on July 28 for a two day official visit. In the framework of his official visits, the president of Serbia visited also Tsitsernakaberd Memorial Complex; laid a wreath at the monument to the victims of the Armenian Genocide. The Serbian delegation paid a tribute of respect to the victims of the Armenian genocide and put flowers at the memorial of the Armenian genocide. Then the president of Serbia planted a fir at the Memory Alley. The delegation took a tour of the Armenian Genocide Museum, where Mr. Tadic left a note in the Commemoration Book. 07.07.09 At the invitation of the president of Armenia Serzh Sargsyan, the president of the Republic of Cyprus Dimitris Christofias, accompanied by his spouse Mrs. Elsi Christofias, arrived to Armenia on July 6 on a two day state visit. Mr. Dimitris Christofias, accompanied by the high-ranking officials of RA and Cyprus visited to the Tsitsernakaberd Memorial Complex. The Cyprian delegation paid a tribute of respect to the victims of the Armenian genocide and put flowers at the memorial of the Armenian genocide. Then the president of Cyprus planted a fir at the Memory Alley. The delegation took a tour of the Armenian Genocide Museum, where Mr. Christofias left a note in the Commemoration Book: вЂњThe condemnation of the Armenian genocide is a duty of the modern world as a whole. Cyprus was and will always be alongside with Armenia in the struggle for the recognition of the Genocide committed by the Young Turks against the Armenian genocideвЂќ. 25.06.09 The president of Georgia Mikheil Saakashvili, who arrived to Yerevan with an official visit, accompanied by the high-ranking officials of RA and Georgia, visited Tsitsernakaberd Memorial Complex. The Georgian delegation paid a tribute of respect to the victims of the Armenian genocide and put flowers at the memorial of the Armenian genocide. After the entire president Saakashvili watered the fir planted by him at the Memory Alley several years ago during his visit to Armenia. 18.06.09 The 4th International Summer School of the young historians from the CIS countries on the theme of вЂњHistory of Daily Routine in the Study of History in the CIS CountriesвЂќ is held in Yerevan from 15-21 June. 22.05.09 On the invitation of Armenian president Serzh Sargsyan today the President of Croatia Stjepan Mesic paid an official visit to Armenia. 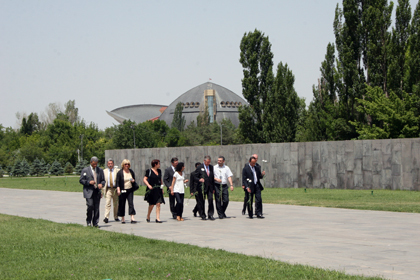 Mr. Mesic accompanied by the Minister of Justice of RA, the Mayor of Yerevan and the director of the Armenian Genocide Museum-Institute, visited the Tsitsernakaberd Memorial Complex. The president of Croatia, who is the first time in Armenia, put a wreath at the memorial of the Armenian Genocide; took a tour in the Armenian Genocide Museum. 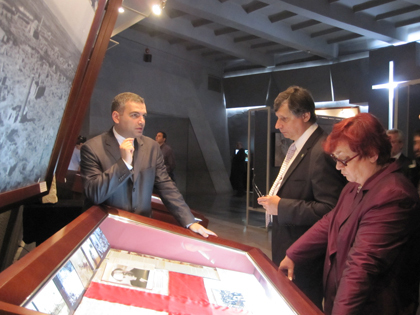 The director of the Museum Mr. Hayk Demoyan represented the story of Armenian Genocide to the president of Croatia. At the end S.Mesic left a note in the museumвЂ™s Commemoration Book: вЂњI bend down before all the victims of human violenceвЂќ. 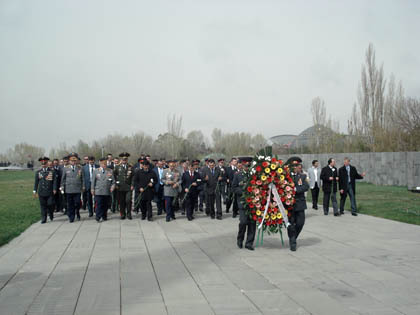 16.04.09 The delegation of the Interior minister of Collective Security Treaty Organization (CSTO) accompanied by the head of Armenian Police Alik Sargsyan visited Tsitsernakaberd Memorial Complex. The representatives of the delegation from Armenia, Russia, Belarus, Kyrgyzstan, Tajikistan put flowers at the memorial of the Armenian Genocide victims and paid a tribute of respect. 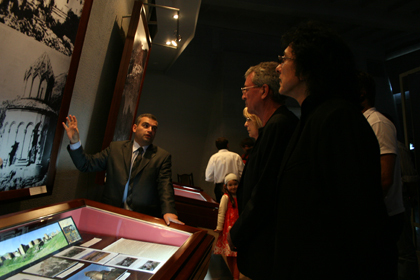 Then the guests took a tour of the Armenian Genocide Museum. 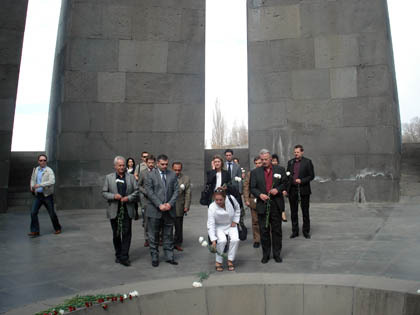 07.04.09 The delegation headed by the Co-chairperson of the EU-Armenia parliamentary cooperation commission Marie Ann Izler Beginn, visited Tsitsernakaberd Memorial Complex and put flowers at the memorial of the Armenian Genocide victims. 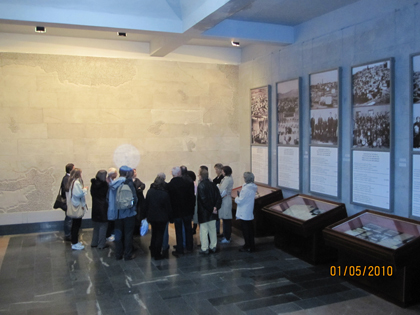 Then the guests took a tour in the Armenian Genocide Museum, where Hayk Demoyan, director of the AGMI, introduced them the history of the Armenian Genocide. 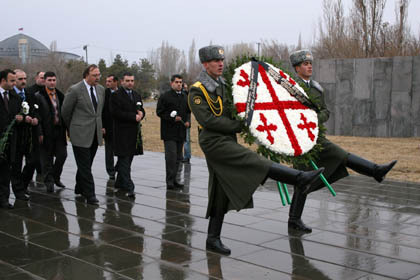 24.02.09 The president of the Parliament of Georgia David Bakradze visited Tsitsernakaberd Memorial Complex and put flowers at the memorial of the Armenian Genocide victims. 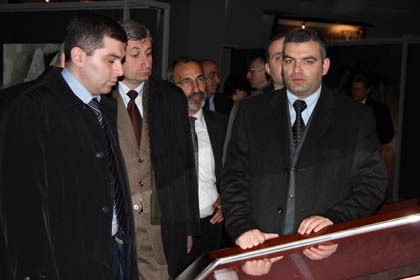 The speaker of the Parliament of Georgia and his delegation took a tour of the Armenian Genocide Museum, where Mr. Bakradze left a note in the museumвЂ™s Commemoration Book: вЂњLife right is the most saint right of all rights. We should remember the history and do everything, not to let genocide and ethnical purge be repeated nowadaysвЂќ. 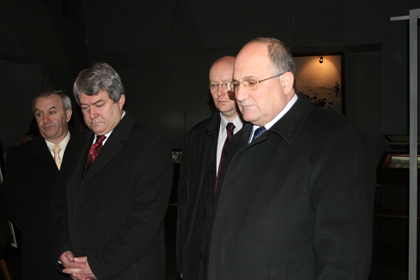 21.02.09 The Foreign Minister of Georgia Grigol Vashadze visited Tsitsernakaberd Memorial Complex. 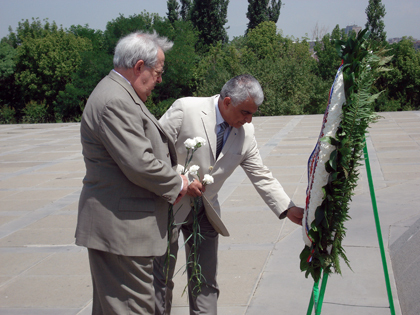 Mr. Vashadze put flowers at the memorial of the Armenian Genocide victims. The Foreign Minister of Georgia and his delegation took a tour of the Armenian Genocide Museum, where Mr. Vashadze left a note in the museumвЂ™s Commemoration Book: вЂњItвЂ™s a very regrettable that the peoples couldnвЂ™t learn lessons from the history till nowвЂќ.